"Right hemisphere loves to work random, creative way; in contrast left-hemisphere loves to follow instructions and discipline." "Right hemisphere takes part in lateral-thinking; in contrast left-hemisphere takes part in vertical thinking." "Right hemisphere deals with pictures, visions, senses, feelings etc; in contrast, Left hemisphere deals with formula, equation, numbers, names, letters, calculations etc." "Right hemisphere works in nonlinear, meshy manner; in contrast, Left hemisphere works in linear, rigid, sequential way. "Right hemisphere see the whole, big-picture. Left hemisphere see one part only". Some example here , here, here , here, here, here et cetera. Thus I developed a concept about behavior of 2 hemisphere. I stuck on a diagram telling the exact opposite. (I've slightly edited the screenshot to enlarge the text and utilize the whitespace). The only thing of the paper maches with popular view, is; the right hemisphere is taking important part in understanding pictures, geometric shapes, extrapolating to fill a gap in an image, etc. 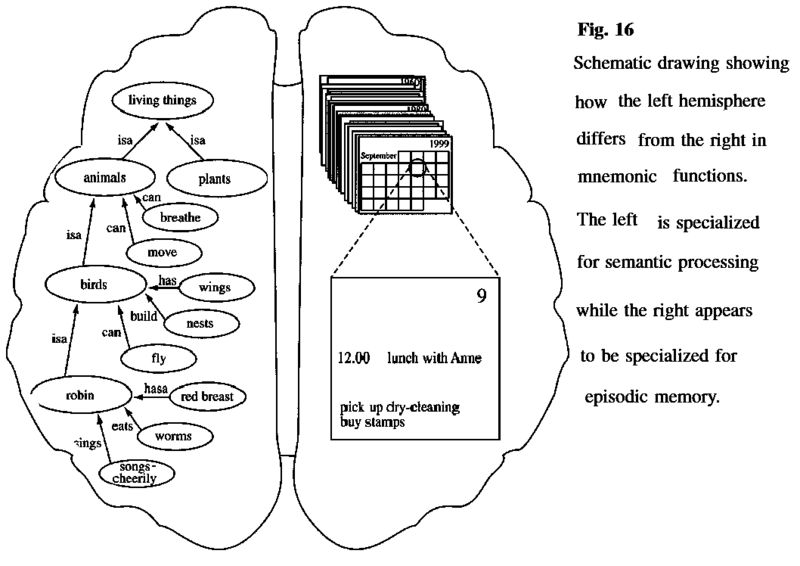 But according to this diagram; actually Left hemisphere is site for viewing the 'big-picture' of a subject ('living things'), finding 'similarity' (sings, eats, has a etc). Also From personal experience, the way of thinking shown as relational-map at left hemisphere, is the cause of 'randomness' in me, so that I keep many books and files scattered while working; or was broken line (que) in school to collect a grass or stone. The thing shown at left side forces me to collect various objects and arrange them... not the rightward one. Also I zone-out too-much and day-dream because of the left-one... not the right-one. In contrast, clearly the right-hemisphere in this diagram, is processing information in much rigid, linear or sequential, disciplined way; and looking a small-part... not the big-picture. So, please could anyone explain me, why should I still have to consider left hemisphere as a rigid linear servant and right-hemisphere as rulebreaker daydreaming artist? You shouldn't. It is one of those stubbornly persistent myths. It is almost entirely false. It is true that in some tasks one half the brain is more prominent (although even in supposed classic cases like speech both halves are actually involved, just one half more than the other). But the idea that one half of the brain is logical and the other intuitive or emotional is simply false. At most one half the brain isbe slightly more prominent in processing some tasks that may be perceived by us as more logical or more intuitive, but that is really as far as it goes. Not the answer you're looking for? Browse other questions tagged cognitive-psychology lateralization brain or ask your own question. Are cognitive functions strictly divided in the left and right hemispheres? How does conscious rational internal thought gets initiated - what gives rise to it on any given day? How to test whether a person is Left-Eared or Right-Eared? How separate are the left and right hemisphere vasculature? Is forward associated with right and backwards with left? Is quick left brain vs right brain test fake?